Not unreasonably, our Bishops have run with the idea that everyone should have the chance to respond to the consultation and have used the tools now available to make it easy for people to respond either by email or online. In the culture of the Holy See this has come as a bit of a shock. (Remember Fr Zuhlsdorf's joke that at the Vatican it is "yesterday's technology tomorrow.") Adding to the fog of confusion have been the inevitable stupid headlines in English language media hailing the consultation as a way for lay people to change the teaching of the Church on contraception and gay marriage. In Italy there are highly competent journalists who comment intelligently (and often with extensive inside knowledge) on Vatican affairs. In the English-speaking world, many journalists are still at the babyish stage of viewing the perennial teaching of the magisterium as similar to political policies that can be changed by popular vote. This is combined with a stubborn incomprehension of the fairly simple distinction between discipline and doctrine. Enter the Press Conference, reported by CNS. The Bishops' Conference of England and Wales put the questionnaire online in late October, on the SurveyMonkey site, leading to news stories about "polling" Catholics for their opinions and suggestions. Asked at the Nov. 5 news conference whether that action was something other bishops' conferences should emulate, Archbishop Baldisseri said the "question answers itself" and was "not worth considering." Archbishop Baldisseri's answer is a wonderful example of Vatican-speak. Does he mean that the question is not worth answering because the CBCEW's action is obviously foolish? Or that is is obviously the right thing to do? Or that the news stories are obviously daft? I suspect that the latter is what he actually intended, though with perhaps a hint of criticism of the CBCEW for acting too precipitately (or effectively) on the idea that the opinions of the laity should be included. This would be in line with the culture at the Holy See (and, to be fair, many large organisations): when under pressure from difficult publicity, make sure to shift the blame onto someone else. At the Vatican this is often done with skilful subtlety. One or two comments I have read seem to lay the blame on the Bishops of England and Wales for the content of the questions. This is unfair, since the questions were not set by them. 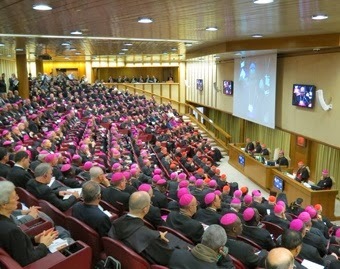 They are the ones given by the Holy See's Synod Office in their Preparatory Document for the Synod. Joseph Shaw considers it The worst survey in the world. Although I have sympathy with this reaction, I think the style is fairly typical of Vatican surveys of opinion. For what it's worth, my own advice would be to keep your answers as succinct as possible and to focus on what is important, especially the promotion of the teaching of Humanae Vitae as a positive, joyful and life-giving teaching that changes people's lives for the better. Remember too, that it is in the Anglo-Saxon exam tradition to insist that the answer must relate strictly to the question. This is not necessarily the case elsewhere. I have completed the first draft of my own response and printed it off so that I can go through with a red pen and make corrections and revisions. When it is ready, I'll let you see it.